June 20, 2011 — UFV President Dr. Mark Evered and his wife Maureen recently returned from an extensive tour of five Chinese cities, organized by Betty Wang, UFV China liaison officer. During their two-week stay, they had the opportunity to meet with key partner universities. “I was delighted to visit some of our current partners and colleagues in China and to have the opportunity to build new friendships and affiliations,” says Evered. Evered started his tour in Dalian where he visited Dalian Software University (DSU) to establish a partnership that will facilitate the transfer of Computer Information Systems students. Talks will be finalized when a delegation from DSU, led by President Weng Jiaju, visits UFV in July. In Dalian, Evered also attended a ceremony to sign an official memorandum of understanding at the City Institute of Dalian University of Technology (CIDUT). The newly minted agreement will enable CIDUT students in their third year to complete their degree in Computer Information Systems at UFV. Evered met a contingent of eight CIDUT students who have already enrolled to study at UFV this fall. In Beijing, Evered visited North College of Beijing University of Chemical Technology to discuss the development of joint academic programming. 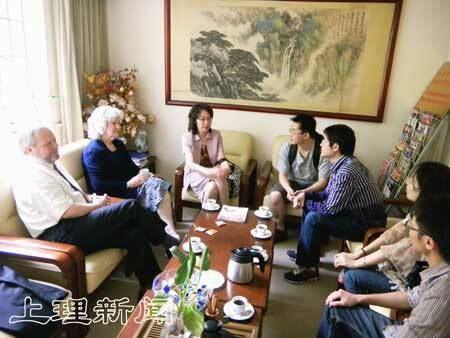 In Shanghai, Evered was warmly welcomed at the University of Shanghai for Science and Technology (USST). UFV has already completed articulations with USST in the fields of computer studies, math, chemistry and physics. The two universities plan to work together to develop more collaborations in the fields of arts, English studies, and food safety. 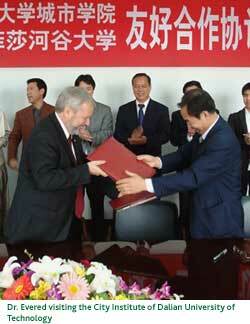 A proposal to establish a China-Canada center at UFV was also put forward. USST’s Dean of Foreign Languages will visit UFV in November to work out the details of the proposed agreements. 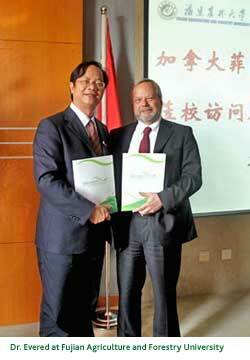 In Fuzhou, Evered joined UFV Agriculture department head Tom Baumann at Fujian Agriculture and Forestry University (FAFU). Baumann made a presentation featuring UFV’s agriculture program and Evered signed an agreement that will enable 40 Chinese students to study at UFV every year. Assembled officials also discussed possible curriculum and faculty exchanges to encourage professional development and the flow of knowledge between the two countries. A delegation from FAFU will visit UFV in July. Evered wrapped up his China tour in Chengdu, where he met President Zhou Jieming of Sichuan Normal University to review the current partnership between the two institutions and discuss expanded collaborations in the fields of business and fine arts.